Viarsa 1 , an illegal fishing vessel, under chase in heavy seas by the Australian Fisheries Management Authority. Management oversight, government regulations, traceability of fishing activities on the seas are a relatively recent development. But while some countries are now making a huge effort to stem overfishing, much more needs to be done. Too few no-go areas for fishing: Protected areas and no-take zones, where fishing is banned or strictly regulated, can provide essential safe havens where young fish can grow to maturity and reproduce before they are caught. But just 1.2% of the world's oceans have been declared as Marine Protected Areas (MPAs), and 90% of existing MPAs are open to fishing. The current lack of protection is especially worrying for fish spawning grounds and the deep sea, both of which are particularly vulnerable to overfishing. Despite the infamous 1992 collapse of Canada’s northern cod populations because of overfishing, EU fisheries ministers failed to learn from these lessons and ignored scientific advice on recommended cod catches for European waters, particularly in the North Sea. For over a decade, the EU Fisheries Council set higher quotas for cod catches than recommended by ICES (International Council for the Exploration of the Sea), resulting in seriously depleted populations. 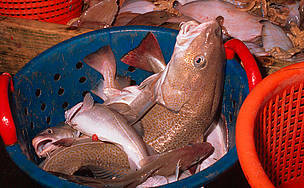 It was only in 2008 that the EU finally took steps to save the North Sea cod fishery. Buy sustainable seafood. By purchasing MSC-certified seafood products, consumers, retailers, and traders are helping to encourage and reward responsible fisheries. Without the MSC label, your seafood may well stem from illegally fished or overfished sources. Take a look at our seafood guides!